Accountability – Public organisations should be accountable for their performance and be able to give complete and accurate accounts of how they have used public funds, including funds passed on to others for particular purposes. They should also have suitable governance and management arrangements in place to oversee funding arrangements. Openness – Public organisations should be transparent in their administration of funds, both to support accountability and to promote clarity and shared understanding of respective roles and obligations between organisations and any external parties entering into funding arrangements. Value for money – Public organisations should use resources effectively, economically, and without waste, with due regard for the total costs and benefits of an arrangement, and its contribution to the outcomes the entity is trying to achieve. Where practical, this may involve considering the costs of alternative supply arrangements. Lawfulness – Public organisations must act within the law, and meet their legal obligations. Fairness – Public organisations have a general public law obligation to act fairly and reasonably. Public organisations must be, and must be seen to be, impartial in their decision-making. Public organisations might also at times need to consider the imbalance of power in some funding arrangements, and whether it is significant enough to require a different approach to the way they conduct the relationship. Integrity – Anyone who is managing public resources must do so with the utmost integrity. The standards applying to public servants and other public employees are clear, and public organisations need to make clear when funding other organisations that they expect similar standards from them. Having set its priorities, objectives, and outcomes, a public organisation needs to have a clear view of what it will do itself and what it will outsource or procure from the market. 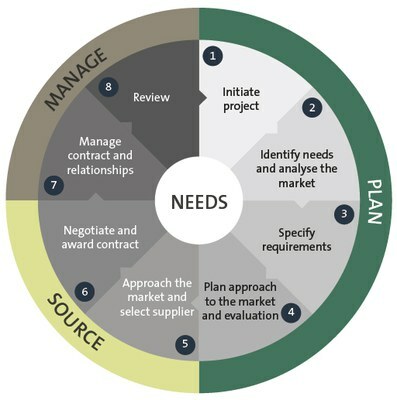 The public organisation can then determine the best strategic approach to meet those procurement needs. that policies and procedures are in place to ensure that staff who are involved in procurement activity use good procurement principles and practices. 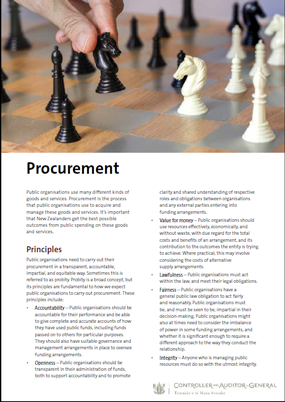 We expect public sector organisations to have clear policy, guidance, and procedures to manage the risks to procurement processes that can arise from actual, potential, and perceived conflicts of interest. Our work indicates that failure to identify and manage these risks effectively is a significant factor where procurements have gone wrong. We expect everyone involved in or with an influence over significant procurements to make a specific declaration so that any risks or issues are identified early and can be managed well. Not all conflicts of interests will be apparent at the start of a procurement process. It is likely that some will become apparent throughout the procurement process, as more becomes known about the companies that might respond to a tender process and the staff that might be involved. It is important that public organisations remain mindful of conflicts of interest throughout the procurement process.